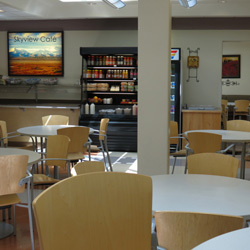 The Skyview Cafe is open all day with salads, sandwiches, beverages, snacks and desserts available. Weekends and holidays are open for lunch only. Check Café Calendar for more details. Linda McClellan, RD is available for consultation in the Dietary offices in UBMC on most Mondays from 8:00 AM – 4:00 PM, although the schedule is subject to change. To schedule an appointment with the dietitian, please call (435) 722-6160. Jacqueline Humpherys, RD is available for consultation in Clinic #1, Suite 201. To schedule an appointment, please call (435) 722-6117. Patient teaching aids on nutrition needs for diabetes, cholesterol, weight control, cardiac, anorexia, and tube feeding problems are available.